The Atta family locked up their Temecula, Calif., home and went on vacation in 2012. While they were gone, Victor Cheng moved in. Cheng had owned the home before the Attas, but he lost it in foreclosure. Nonetheless, he filed a fraudulent deed with the county recorder's office, transferred the utilities into his name and even tried to evict the Attas after their return. During his prosecution for burglary, trespassing and filing a false document, he insisted that he was not the person being prosecuted because the indictment spelled his name in all capital letters. • Cherron Phillips of Chicago was upset that she was barred from the courtroom during her brother's trial on drug charges. So she filed false $100 billion liens against the property of 12 people involved in the case—including the U.S. attorney and chief judge then serving in the Northern District of Illinois. When she was prosecuted, she insisted on representing herself, called herself River Tali El Bey, then filed numerous documents that the judge called "clotted nonsense." • In New Jersey, Ronald Ottaviano's company offered a debt elimination plan that purported to draw money from a secret bank account maintained by the U.S. Treasury in each citizen's name. Potential customers were told that these fabricated accounts were set up to allow the government to borrow against each citizen's earnings, and that individuals who file the right papers can gain access to the accounts. After his own employees turned him in, Ottaviano defended himself against charges of fraud, money laundering and tax evasion. He told the court that he didn't believe he was subject to U.S. taxes. What all of these cases have in common is that they are part of a movement of "sovereign citizens," according to law enforcement officials. Sovereigns—also called "freemen on the land" or "organic citizens"—believe that an illegitimate, usurper federal government has taken over, and that they don't have to pay taxes, pull over their cars for police or obey any other law they don't like. These beliefs may sound silly, but sovereigns can be difficult to laugh off. For one thing, even though they don't believe they're subject to laws, they use laws as weapons. The FBI has called sovereigns "paper terrorists" because they so often fight perceived enemies—generally public employees—by filing false liens, false tax documents or spurious lawsuits. These can hurt the victim's credit, stymie attempts to sell or refinance property, and take years and thousands in legal fees to correct. The trouble doesn't stop there. When involved in any legal matter, from pet licensing to serious criminal charges, sovereigns are known for filing legal-sounding gibberish, usually pro se, learned from other sovereigns who sell lessons in "law" online. Frequently, they cite the Uniform Commercial Code, maritime law and the Bible. They're also known for the sheer volume of their filings, which can double the size of a normal docket. This can frustrate and delay courts as they consider the defendant's competence and otherwise try to minimize disruptions. With many court systems fighting heavy caseloads and budget cuts, these extra headaches are unwelcome. And though most sovereigns are not violent, there are exceptions. The FBI has declared them to be domestic terrorists because they occasionally get into armed confrontations with law enforcement. A sovereign father and son, Jerry and Joseph Kane, were responsible for the 2010 murders of two West Memphis, Ark., police officers, during what should have been a routine traffic stop. Jerry Kane was a known figure within the sovereign movement, traveling the country to sell ideas on debt elimination and stopping foreclosure. His girlfriend, Donna Lee Wray, later made news by flooding Tampa's local government with paperwork when they wanted her to get a dog license. Nor are officers of the court immune, says J.J. MacNab, a Bethesda, Md., insurance analyst and litigation consultant who has tracked the sovereign movement for years. "In the recent past, it's mostly been about police officers," says MacNab, who has chaired several ABA committees as an associate member. "But now we're looking at judges, county clerks, prosecutors—even public defenders." Some sovereigns hold trials in their own "common-law courts," convicting public officials in absentia and sentencing them to death for "treason." This can be seen as an indirect threat against those "convicted." But the violence can also be direct. Alaskans Lonnie and Karen Vernon, a couple involved in the Alaska militia run by political activist Schaeffer Cox, plotted to kill a federal judge and an IRS officer who handled their tax prosecution. At the behest of his friend Robert Chapman—a sovereign also known as "General Chapman"—sovereign John Ridge Emery III handed a Charlotte County, Fla., traffic judge an envelope he believed contained anthrax. Sovereign citizens are not considered to be an organized group. According to Mark Potok of the Southern Poverty Law Center, which tracks extremist groups, they're difficult to count because they lack a leader or a unified ideology. The SPLC roughly estimated that there were 300,000 sovereigns in the U.S. in 2011, with about a third, or 100,000, as hard-core believers, Potok says. He suspects the percentage of hard-core believers has since increased. "There's still a fair amount of anecdotal evidence suggesting it is spreading," Potok says. "It is the single most widespread idea from the radical right." According to the SPLC, sovereigns generally believe the legitimate U.S. government has been overthrown and replaced—perhaps during the Civil War or in 1933, when the gold standard for currency was abandoned. Because the country was then broke, the story goes, its leaders set up Treasury accounts in the name of each baby born in the United States, permitting the government to borrow against that person's future labor. Each account is supposedly organized as a trust or a corporation. If you can legally separate this "strawman" account from your person, sovereigns believe, you can use the money for your own purposes and put yourself outside the reach of the law. This "redemption" is generally accomplished by filing documents full of nonsense legalese, often based on packages or lessons sold online. Sovereigns sometimes say they are subject only to "God's law" or to "common law," meaning the U.S. legal system as they believe it existed before the conspiracy. They may declare themselves independent nations, join fictional American Indian tribes or attempt to create a replacement government within the sovereign community. Sovereigns believe official government documents with names in all capital letters refer to the strawman, which is why so many deny that they are the person named in court documents. The strawman theory also underlies sovereigns' reliance on the Uniform Commercial Code, since they see most legal matters as financial transactions. Government employees are in on the scam, they say, which is why they don't accept sovereign arguments and documents. The SPLC says early sovereigns were generally white people with racist beliefs—for example, contending that Jews controlled the financial world or that African-Americans could not be sovereigns because their citizenship was granted by the 14th Amendment. Some still hold those beliefs. But in the 21st century, adherents are diverse and not necessarily racist. "They're spread over every [demographic]. It could be a 20-year-old black college student. It could be a 66-year-old woman," says MacNab, who is writing a book about the movement. She says a lot of law enforcement officers "assume that if the person is not a [stereotypical] militia guy, they're safe. ... That's not true anymore." Indeed, sovereigns now include a large contingent of African-Americans, sometimes drawn from black separatist or religious movements. Potok believes as many as half of all sovereigns could be African-American. In Hawaii, sovereign ideas have caught on among some Native Hawaiian activists. And the ideology, MacNab and Potok say, is spreading into other English-speaking countries. Part of the reason the ideology has spread is the availability of the Internet, MacNab says. Reports say sovereign ideas are also spread in prisons. Once involved, the SPLC says, new sovereigns are part of a large subculture with an active online community. They frequently learn more sovereign ideas—and the sham legalese they use in court—from websites or hotel seminars selling how-to kits for profit. These are also popular ways for sovereigns to sell bogus methods for fighting taxes, debt or foreclosures. The people peddling these ideas are sometimes prosecuted for fraud or tax evasion. But, Potok says, "probably the most important driving factor of this particular ideology has been the economy." He notes that the number of sovereigns has risen dramatically since 2008, when the economy started faltering. In addition to being used to fight foreclosure, sovereign ideas have been used to attempt to steal title to foreclosed properties. With widespread foreclosures and job losses, it's not hard to see the appeal of an ideology that, as Potok says, "promises you something for nothing." Nevertheless, sovereign ideas can create real problems for the legal system. For one thing, even when sovereigns are genuinely trying to participate in a case, they're often disruptive. Because they believe their own legal system is the only legitimate one—and because they frequently resent authorities they feel are not legitimate—they have trouble cooperating with even the most basic of requirements. D. Loren Washburn, a former tax prosecutor in Utah, recalls a woman who was subpoenaed to testify in an investigation of her father for tax evasion. (Sovereigns have a lot of overlap with tax defiers, so tax prosecutors are familiar with the ideology.) She declined to answer questions, he says. "We said, 'Are you in any way related to him?' " recalls Washburn, now a shareholder at Clyde Snow & Sessions in Salt Lake City and a member of the ABA Section of Taxation's Civil and Criminal Tax Penalties Subcommittee. "She said, 'They say he's my father, but there's never been a paternity test.' "
The woman was prosecuted for obstruction of justice, but when she got to court, she refused to admit she was the person named in the indictment. The judge jailed her for contempt of court, believing, Washburn says, that an afternoon in jail would convince her to comply. Instead, it took about three months. "The judge was eager to let her out, but at the same time wasn't eager to encourage or indulge in any way this crazy fiction of 'I'm not that person because you spelled my name with [capital] letters,' " says Washburn. "And as a result, she stayed in jail for months and months, and she was the mother of five kids. … The calls from her father said, 'Don't let them bully you; you'd rather die in jail a martyr to the United States of America than give in to this tyranny.' Then you'd hear a phone call from her husband saying, 'Your father's an idiot.' "
He adds, "On a personal level, you see a lot of tragedy in it." Another form of disruption is the tendency among sovereigns to represent themselves, even when a public defender is available. Though the movement is full of legal gurus selling false ideas about the law for profit, there are few or no licensed attorneys in it. And because sovereigns believe that the government and its laws are illegitimate, they don't value the help of an attorney. But without a defense attorney as gatekeeper, no one stops sovereigns from proceeding under their version of the law. In the Cherron Phillips case, Phillips invoked the Uniform Commercial Code and the Federal Rules of Civil Procedure, saying she was representing the Cherron Phillips estate/trust as a creditor to the United States. She drew a distinction between the "United States of America" and the "United States." Ultimately, the judge revoked Phillips' right to represent herself, saying he was concerned that her "obstructionist" behavior, if permitted in front of a jury, would quickly lead to a mistrial. He said Phillips consistently refused to produce documents that made sense, or defend her documents when pressed. After the case moved to the Southern District of Illinois, the new judge agreed to a competency evaluation. The trial has been tentatively scheduled for June 16. A defense attorney for the woman in Washburn's anecdote had also defended Brian David Mitchell, the man who kidnapped Elizabeth Smart from her family's Salt Lake City home in 2002. Mitchell, charged with the kidnapping after Smart was found nine months later, was diagnosed with mental illness. Washburn says the attorney found the challenges of representing the two defendants very similar. "The reality is: You have to have a lot of patience and work to create a practical sense in them of what the outcome is," he says. To make matters worse, these defendants aren't generally interested in a plea bargain, says former tax prosecutor Bill Lovett, now managing partner at Collora in Boston. "They're waiting for their day in court so they can get up in front of a judge and a jury and make these arguments," says Lovett, part of the Civil and Criminal Tax Penalties Subcommittee of the Taxation Section. "It takes up a higher percentage of the time to get the case done." And then there's the volume of their filings. "I've seen sovereign citizens have to buy a new printer because there's so much paperwork," says Joseph Rillotta, a former tax prosecutor now with Williams & Connolly in Washington, D.C., and another member of the Taxation Section. 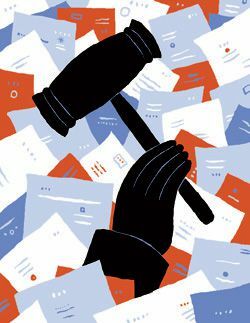 "These are people who are very fond of paperwork," says Michelle Nijm, assistant general counsel in the office of the Illinois secretary of state. "Even in court these cases drag on. They file nonmeritorious motions," which can be fought, "but it takes time and it's expensive." Nijm cites a group of attorneys who were targeted by a frivolous UCC filing. After the filer included their Social Security numbers in a public filing, the attorneys had to ask the court to expunge that record. The attorney fees were $20,000. MacNab says the volume of filings is a "huge problem"—not only because it clogs the courts, but also because fatigued officials sometimes drop the matter. And any small victory is taken as evidence that sovereigns' extreme legal systems work. She says the Florida dog license incident involving Donna Lee Wray stands out in her mind. "She refused to pay. They tried to fine her $25, and she hammered the court with paperwork, ... something like 65 filings." "The county government just gave up, which is unfortunate because then she turned around and packaged her materials as 'This is how you get out of taxes.' "
Fraudulent liens are one area where the law often permits sovereigns to succeed. That's because the UCC does not permit clerks to reject filings that are clearly bogus. Guided by online kits, sovereigns in many states are free to claim falsely that law enforcement officers, judges or others who upset them owe them millions of dollars. According to a 2013 report from the National Association of Secretaries of State, bogus UCC filings have risen dramatically in the past few years, driven by a rise in people identified as sovereign citizens. Nor is there a requirement to notify the victim of the false lien. "Typically, of course, you don't find out about it until you get a job offer and you go to sell your house and find that you're facing this gigantic lien," says Potok of the SPLC. "Which, of course, you don't really owe—but it takes thousands of dollars in lawyers to sort out the title and get that settled." Until fairly recently, the only real remedy was to go to court, with all of the attendant costs and delays. The NASS report says victims can file other statements to dispute the debt, but they can be missed in a creditor's electronic records search. That's why states have begun passing laws to fight false liens. According to the NASS report, at least 17 states permit offices either to refuse to accept bogus filings or expunge them from the record after filing. At least seven states have a system for expedited judicial relief; at least 14 allow penalties in a civil lawsuit; and at least 10 make filing a false lien a crime. Many of these laws were passed within the last seven years. On the federal level, the Court Security Improvement Act of 2007 made it illegal to file a false lien as retaliation against a federal employee. North Carolina was one of the first states to address bogus filings, but Secretary of State Elaine Marshall says she would like to see more state laws designed to keep the burden of removing false liens off the victim. She also urges state officials to learn the signs that a filing is coming from a sovereign. "There are very clear symbols that these [filings] are for some purposes other than the intent of the UCC," she says. For example, she says, "when it's $50 million and the debtor and the creditor are the same person. [Or] the way the punctuation and the way the spelling are, the addresses, the envelopes give them away, the color of ink, the red fingerprints." Detective Rob Finch of the Greensboro, N.C., police department agrees. He and fellow detective Kory Flowers were among the first law enforcement officers to research sovereign citizens, and they often write and lecture on how law enforcement can handle sovereigns safely. "Awareness is quite frankly the best tool," he says. "If you deal with a sovereign in your courtroom, be aware… [that you] need to run all [your] property and make sure there's no festering lien that's been sitting there for six months or a year." Meritless lawsuits are another way sovereigns may retaliate. The suits are sometimes not even structured properly, MacNab says. "Often they don't name a defendant," she says. "They try to frame it as a criminal lawsuit. [The cases] float around the federal court system." And sometimes, sovereigns file false tax forms against people who have upset them. This generally means filing a false Form 1099, which says they have paid the victim a large amount of nonwage money. When the IRS receives these, it expects the victim to pay taxes on that money—and when the return doesn't match, it can trigger an investigation. "In the case of a judge or a prosecutor, they'll figure it out because generally the IRS is involved in the case to begin with," says Lovett. "But it can do some damage to unwind it." A less common but very important concern is violence from sovereigns, particularly targeting law enforcement. A 2012 Anti-Defamation League report, The Lawless Ones, counts seven armed confrontations between sovereigns and law enforcement since 2010. It also notes threats or violence against judges, elected officials and even sovereigns' own families. MacNab says she believes violence may become more common as sovereigns realize they aren't getting what they want. "Most of the retaliation is in the form of liens—sometimes in the form of threats, and in very rare cases they act on the threats," she says. "I think they're moving in that direction, unfortunately. And if enough people threaten, some people will start acting on it." She cites the Alaska group led by political activist Cox, who has identified himself as a sovereign citizen. Cox was convicted in a fairly high-profile 2012 trial, along with some associates, of conspiracy to murder federal officials, solicitation of murder and multiple weapons charges. The charges were based partly on his "241" ("two for one") plan—saying he would kidnap or kill two government officials for every one of his associates detained or killed by the government. In part because of threats like these, some states have outlawed sham legal processes, false legal tribunals held out as genuine, and impersonation of court officials. Cox famously convened this kind of court in the back of a Denny's restaurant in Fairbanks, acquitting himself of a real-world domestic violence charge. (In a genuine court, he ended the charges by pleading guilty to reckless endangerment.) More frighteningly, these courts have been used to convict and sentence government officials who have upset sovereigns. "They will put the judge on criminal trial in absentia. And the penalty for treason is death," says MacNab. "They're always going to find you guilty." Washburn says he's never experienced actual violence, although "I guess I've been indicted by courts of sovereign citizens and threatened to be hung in a public square." Once, he says, a "process server" for a sham sovereign court came to his parents' house and to the home of the judge in the case. MacNab says that while violence is a threat, a lot of sovereigns leave the movement rather than turn violent. This is not generally because they face the legal consequences of their actions, however. Like the father of the woman in Washburn's anecdote, sovereigns may believe that being jailed is a sign that the conspiracy is real. "They will go to prison and recruit everybody there," MacNab says. "Look at someone like [notorious tax defier] Irwin Schiff. He's been in and out of prison since the '70s and nothing has awakened him." Washburn believes it's tough to break through sovereign ideas because those ideas are held almost religiously. "They end up being criminally prosecuted not so much because the [dollar] amount at issue is high, as because they antagonize the system repeatedly and thoroughly and almost refuse to be ignored," he says. "More than even a financial crime, they are taking a stand against what they view to be a corrupt system. It becomes almost as much a religious or philosophical stand as anything having to do with money."